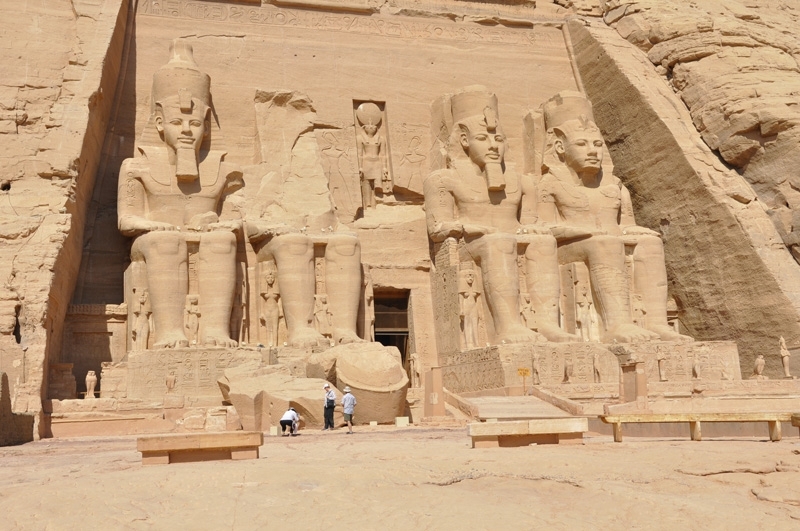 The second most visited and popular site after the Pyramids at Giza are the Temples of Abu Simbel at Lake Nasser. The Huge Temple of Ramses II , the Pharaoh known as the Great Builder, sits on the edge of Lake Nasser next to the Temple of Nefertari, his most favoured wife. 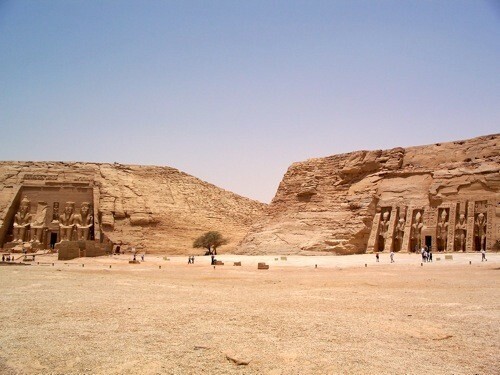 A three hour drive from the City of Aswan and flights available direct from Cairo to Abu Simbel next to Lake Nasser. The four statues which stand over 65 feet tall, finely reproduce the features of the sovereign, adorned with the crowns of Upper and Lower Egypt and the cobra symbol, the uraeus, the attribute of Osiris. From the purely static point of view the architects of the period solved the serious problem of the stability of the complex by using the four colossi as load-bearing pillars, against which the enormous load of the rock mass behind was equally distributed. A multitude of slaves under the orders of head sculptor Pyaya, whose name is recalled in an inscription, completed the elaborate front of the Temple, framed by a convex molding called torus, surmounted by a cornice with Uraei, above which runs a high-relief strip depicting twenty-two seated baboons, each over eight feet tall. The ruthless work of nature attacked the temple even in ancient times; in fact , the most serious damage was caused by earth tremors. 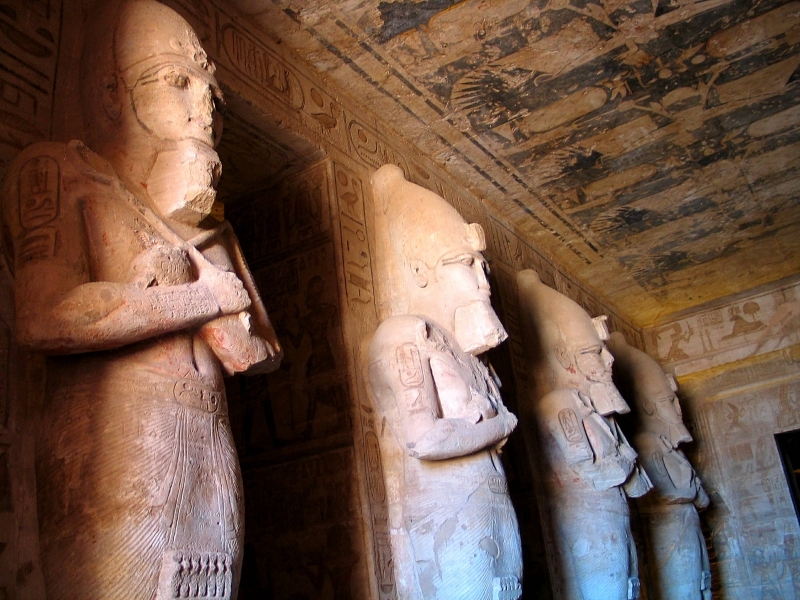 One of the Colossi, the third from the left, was repaired in the time of pharaoh sethi II, while the upper part of the second which fell during the 34th year of Ramses reign, has lain on the ground ever since. 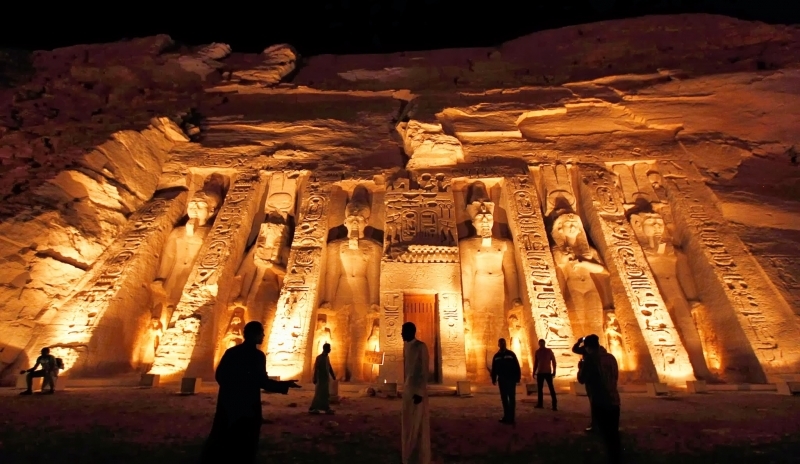 The rock sanctuary of Abu Simbel symbolizes the boundless ambitions of the most powerful Pharaoh of ancient Egypt. Dedicated in theory to the tiad of the divinities consisting of Amen-Ra, Harmakhis and Ptah, the temple was actually built to glorify over the centuries the name of its builder, Rameses II the Great, who reigned for 67 long years.The images of the pharaoh, repeated some hundred times on the façade and the walls of the several rooms, show him at various moments of his life: son, husband, proud father, victorious warrior and, finally worshiped as a god on earth. 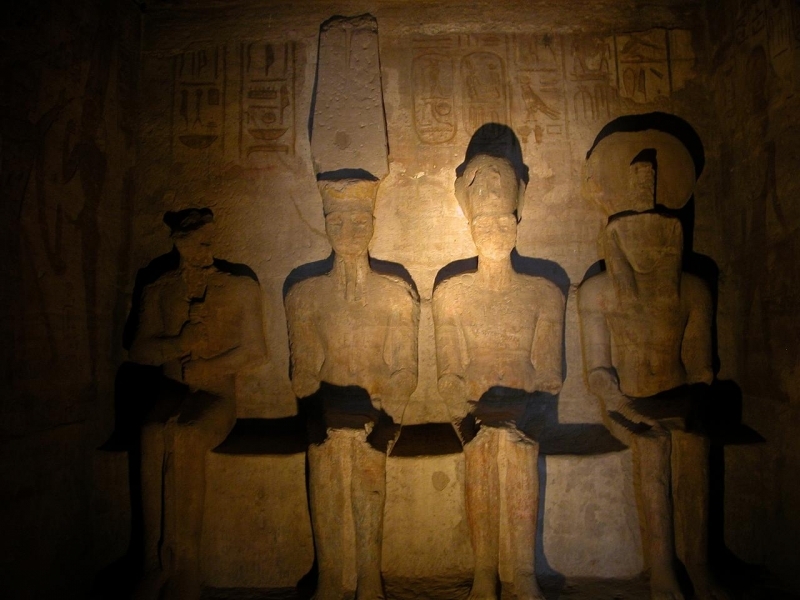 The giants on the left wear the white crown of upper Egypt, while those on the right wear the Pshent (double crown); the hands crossed on the chest hold the Heka and the Nekhaka, both symbols of power and royalty. Most of the wall paintings illustrate scenes from the battle of Kadesh, which victoriously concluded the pharaoh's military campaign against the Hittites in the fifth year of his reign. Most scenes show the sovereign sacrificing prisoners to the Gods, and the bas-relief that shows the pharaoh standing in his war chariot seizing his bow is an absolute masterpiece. Six more rooms in which the votive offerings were placed surround this room to the right and left. The Pronaos is followed by a second hypostyle room supported by four square pillars on which pictures of the pharaoh seated in front of various divinities are painted. The scrarium the most remote and secret part of the temple, is situated 215 feet from the entrance, in the heart of the mountain. In this small room, which measures 13 feet wide and just over 23 feet deep, stand the statue of Amun-Ra, Harmakhis, ptah and, Rameses II. Twice a year, at the solstices a ray of sunlight penetrating the entrance from naos at 5:58 a.m. and floods the left shoulder of Amun –Ra with light.A few moments later, having touched the image of the sovereign, it concentrates on Harmakhis the "sun miracle" lasts for around 20 minutes. It is very significant that the statue of the last divinity is never touched by sunbeam, as Ptah was the Lord of the Darkness. The gradual illumination of the three Gods takes place between February 10 and October 21 the first rays of the sun are exactly on the axis of the Temple; the second date corresponds to the first jubilee, celebrated after 30 years of Rameses II reign. 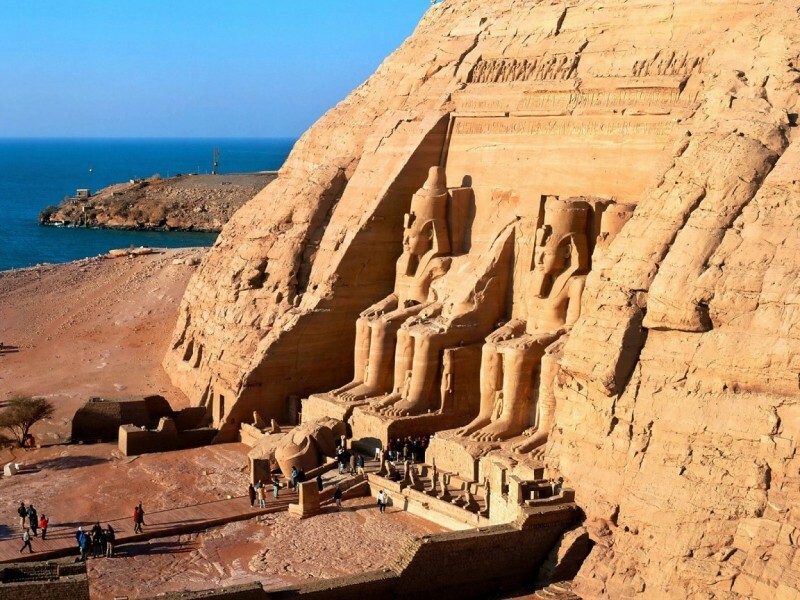 When it becomes necessary to dismantle the temples of Abu Simbel and rebuild them in a higher position to save them from the water of the artificial Lake Nasser. The great Temple was cut into 807 blocks with an average weight of 20 tons each and reassembled on a huge reinforced concrete skeleton.